No, I'm Not Talking to Myself: I think Buzzfeed is following me. I think Buzzfeed is following me. I typically refer to Diet Coke as the "Sweet Nectar of the Gods." Buzzfeed shortened it to "sweet nectar," but the sentiment is the same. I really like their term "silver cylinder of joy" and plan to use it often in conversation. "How's your day going, Shelley?" "Great, now that I have my silver cylinder of joy!" Okay, that kinda sounded vulgar. Scratch that one for polite conversation. I'll stick to "Sweet Nectar of the Gods." 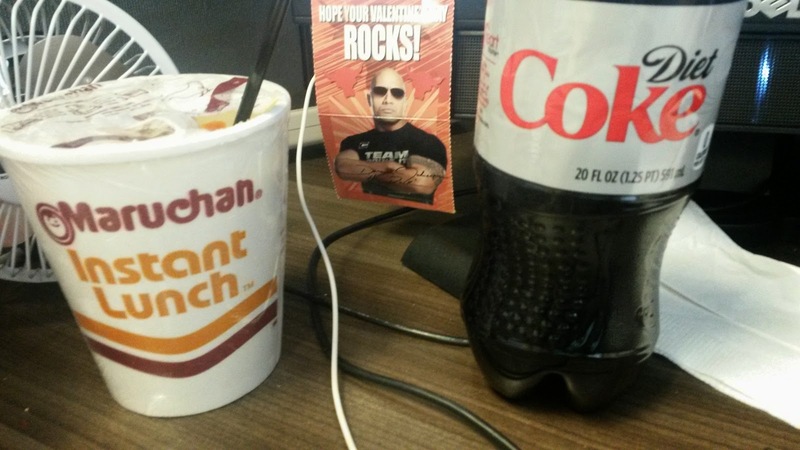 Pro tip: I make ramen tolerable by pairing it with the Sweet Nectar of the Gods, and sharing my lunch break with my love, The Rock. The only thing Buzzfeed left off the list was, in my opinion, the NUMBER ONE thing Diet Coke addicts hate to hear. "The vending machine is out of Diet Coke." Previously on "Not Talking to Myself..."